Looking for laser spine procedures in Jacksonville, FL? 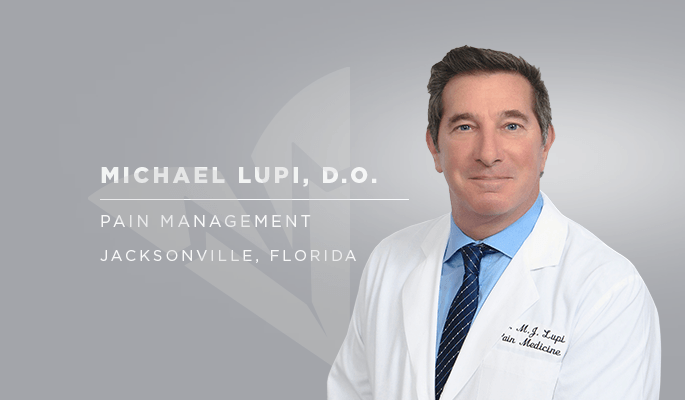 Dr. Michael Lupi specializes in the treatment of neck and back pain, as well as musculoskeletal and neurological disorders, in PPOA’s Jacksonville location. Harvard-trained, he is a fellow of the American Board of Physical Medicine and Rehabilitation with board certification in the subspecialty of Pain Medicine. For almost 25 years he has been hailed as a pioneer: Dr. Lupi implanted the first peripheral nerve stimulator for failed knee replacements, served as a certified medical review officer and independent medical examiner, and has lobbied congressional committees about curbing the opioid crisis. This forward-thinking spirit has also led him to embrace laser spine procedures. The Holmium YAG laser is the latest tool used by Physician Partners of America to relieve neck and back pain without opioids. It precisely targets pain-causing nerves along the spine and ablates them quickly. The incision is just 2-3 mm. – less than a quarter-inch. That means muscles and tissue are not cut or torn, and recuperation is measured in days, not months. You walk out after the procedure and, for most people, the pain is gone. Dr. Lupi performs this procedure for two common debilitating conditions: arthritis of the spine and facet disease. His offices accept Medicare and most insurance. You can be sure he will explain all your options, from conservative to cutting-edge, and do his best to get you back to doing the things you love. Learn how laser spine procedures in Jacksonville can change your life! Make an appointment with Dr. Lupi at www.ppoajax.com or call (904) 844-0017.